The grant was announced last week by U.S. Sen. Barbara Mikulski of Maryland, who is chair of the Commerce, Justice and Science Appropriations Committee. 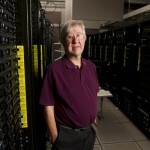 The network will allow for the transfer and analysis of the kind of complex and massive datasets being produced today in scientific fields such as astrophysics, medical research, genomics and turbulence modeling, according to Johns Hopkins physicist and computer scientist Alexander Szalay, one of the lead researchers on the new grant. This installation, supported by the NSF’s Office of Cyberinfrastructure, will allow Johns Hopkins to receive huge data sets from Google, Oak Ridge National Laboratory and the San Diego Supercomputer Center, among others, according to Szalay, who is the co-principal investigator on the grant with Jonathan Bagger and Mark Robbins, both professors in the Department of Physics and Astronomy at Johns Hopkins. The new system will be housed in a powerful, energy-efficient computing center in the Bloomberg Center for Physics and Astronomy on the Homewood campus, in a space that once served as the mission control center for NASA’s Far Ultraviolet Spectroscopic Explorer satellite. This renovation and transformation is being supported by a $1.3 million stimulus grant administered through the National Science Foundation. Housed in the new space will be the Homewood High-Performance Cluster, which brings together the resources of investigators in both the Krieger School of Arts and Sciences and the Whiting School of Engineering to create a powerful and adaptive co-op facility that is designed to support large-scale computations on the Homewood campus. The new apparatus will allow Johns Hopkins researchers—not to mention those at other institutions, including universities and national laboratories such as Los Alamos and Oak Ridge—to conduct research directly in the database. “This new National Science Foundation grant will facilitate lightning-fast connections to the Internet, which together with our new NSF-funded computer facility, will allow Johns Hopkins researchers to lengthen their lead in data-intensive science and engineering,” Bagger said. The network will be supported by the regional Mid-Atlantic Crossroads research and engineering network at the University of Maryland, College Park. About $950,000 of the grant money comes directly to Johns Hopkins, and the remaining $250,000 goes to the University of Maryland. This will enable Mid-Atlantic Crossroads to upgrade the equipment connecting their Internet hub to Johns Hopkins.